Halftime – July 2014 at Keller Williams Advantage II Realty. We are half way through the year! Several months back I posted a blog titled Do your daily activities match your goals? You can read it on my website, www.rickbosley.com and select [behind the desk] In that blog, I asked you when you felt the pain. Have you already felt it, will you wait until the end of the year? Perhaps you are having a banner year, there is no pain, so I will ask another question; have you reached your full potential? How have you performed the 1st and 2nd quarter? Just like team USA in the World Cup, half time is when they sit down and evaluate what is going well, what is not, and make adjustments to ensure that they perform in the 3rd and 4th quarter to get the desired results they intended. What are some of the adjustments that you need to make? What are you pretending not to know? Please reach out to me for help in evaluating your first half of play to guarantee a win in the second half on this year! There are some fantastic educational events taking place this month At Keller Williams Advantage II Realty. Every Monday from 7:30 am – 9:00 am, join me and several others for the BMBC, or Business Minded Book Club. We will be starting our 3rd book, The 4 Disciplines of Execution, which shares with you a simple, repeatable and proven formula for executing your most important strategies in the midst of the whirlwind and chaos we call Real Estate. RSTLM, AKA, Recruit-Select-Train-Lead-Motivate; or in Layman’s terms, how to find and attract people who you want to be in business with, how to hold them accountable, train them, lead them, motivate them, and ensure a long lasting relationship. Action Train Lead Motivate will be taught on July 9th and Recruit Select on July 28th. Tom Nestor, ALC member attended TLM recently and stated, “I have been to this class twice before, and feel like I am hearing things for the first time. I will be using these strategies for my EA, however, I can use them for myself and will see an immediate improvement.” You see, attending these courses not only will help you to build a bigger, faster, stronger team, it will also provide you with tools to train, lead, and motivate yourself as a single agent. In Recruit Select, it isn’t only needed when you hire someone, because it is an ongoing process. Where else do we choose who to be in business with? Perhaps our lenders, title company, listings that we choose to take? Please RSVP to DOC@KWWaterford.com to save your seat. GPS on July 17th at 4:00. Cory Older, The Managing Director of KW Ventures at KWRI will be flying in to share with us the opportunities with the Global Property Specialists designation. If you are interested in expanding your network outside of the US, then you need to attend. With GPS, you will receive training and coaching, Branding and Marketing resources, Technology and Online Marketing, and Access to a referral network. For more information visit; http://www.kw.com/kw/global-property-specialists.html. Keller Williams is a training and Consulting company that happens to be in the business of Real Estate. I look forward in seeing you soon! For any questions, please feel free to reach out to myself or someone on my team at 407-393-5901! Good Luck on this St. Patrick’s Days As we celebrate this Irish holiday, and carry on many of the superstitions, it is a day that we all look forward to, as it gives us a reason to wear green, get kissed, and find good luck as we go across the rainbow to find the pot of gold. As generations pass, often so does the true meaning of the holidays in which we celebrate. St. Patrick’s Day is a cultural and religious holiday celebrating the death of the most commonly recognized patron saint of Ireland, St. Patrick. In the 17th century it was observed by the churches and commemorates the arrival of Christianity in Ireland. St. Patrick’s day has become a holiday of drinking because the church lifted the restrictions of eating and consuming alcohol and we have since then taken advantage. 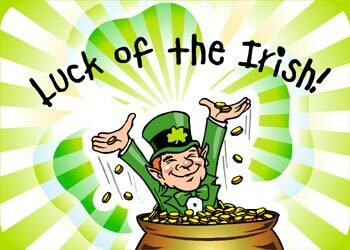 With St. Patrick’s day, comes “the luck of the Irish.” Although there are many references, it is said that it was originated in the United States in the Western Gold Rush, where many of the Irishmen fell onto a “pot ‘o’ gold”. As I am 31 years old now, and have worn green as long as I can remember, and through the last decade have spent march 17th looking for lucky kisses and drinking green beer, I am only now seeking to understand what we are really celebrating. So what does all of this have to do with a Real Estate Coaching website? For me it is about testing assumptions. We have heard in BOLD about the daughter who asked her mother why she cut off ends of the ham off prior to putting into the pot, and the mother told her daughter, “that is the way your grandmother taught me, go ask her” who then told the little girl, “that is the way your great grandmother taught me, go ask her” who told the little girl, “we didn’t have a pot large enough for the whole ham”. For three generations, no one has tested the assumptions of how to cook a ham. As entrepreneurs in Real Estate, what assumptions do you have simply because that is what someone told you, or has shown you? If you are reading this, you are likely a self-employed individual, who wakes up everyday and must be self motivated. What are your daily tasks, and are you motivated to get them done? Why is that important for you to get them done? I see it every day, week, month, and year, that some individuals in real estate “get it” and some are a little slower out of the gate. Which are you? Often times, those not seeing as much success will refer to the successful agents as “just being lucky.” I personally don’t believe in luck. To me, luck is simply defined as when preparation meets an opportunity. The Irish were “lucky” when they struck gold; or they were prepared with the materials, planning and location, and a great opportunity in the Gold Rush opened up. Some agents are “lucky” that they got that listing; or they were prepared with their scripts, expert knowledge in the area, and were able to show value to the complete stranger who gave them the opportunity. At Mega Camp in Austin, TX last year, a guest speaker told us, that he would rather be over prepared for an opportunity that never comes, then not prepared for an opportunity that passes him by. What opportunities have you missed? What is the next opportunity you are getting prepared for? So, Good luck on this St. Patrick’s Day, and don’t blame bad luck, blame a lack of preparation or missed opportunity, and don’t take credit for good luck, but rather pat yourself on the back, as you were prepared for the opportunity that was presented to you. Who is the leader you are following? Going into the 3rd year as the Team Leader for this office I am learning valuable lessons. Speed of the Leader, Speed of the Pack; and before one will buy into the Vision they must buy into the Leader. So much of what we all do revolves around Leadership. The mission for KWRI is to build careers worth having, businesses worth owning, and lives worth living. The Vision is to be the Real Estate Company of Choice. Those are both amazing, yet, what is the mission and vision of me as a Team Leader. At Family Reunion this last February, I went with the intent to learn how to better tell our story, and to better share the mission and the vision of the office. Mark Willis stated during the State of the Union, The mission is why we exist, and the vision is what happens when we carry out our vision. What is your mission as a REALTOR®? Why do you exist in this industry? When you carry that out, what will happen to you, your family, your clients, and your legacy? As the Team Leader, over 150 Realtors and Real Estate professionals have entrusted me with their careers. My mission and vision is getting clearer every day. My mission, (why I exist), is to assist people breakthrough their personal and professional barriers to have the life they desire. When I carry out my mission, my vision is for Keller Williams Waterford Lakes agents to help more families buy and sell real estate, than any other company in ORRA. We are on our way to #1, and every day we are getting closer! Who is the leader you are following? What is their mission and vision, and how does it impact you achieving your vision? If you would like to speak more formally about some clarity on the mission and vision of your company, or how to raise your leadership lid, please reach out to me direct at 321.277.5791. Do your Daily Activities Match your Goals? As Team Leader for the Keller Williams office in Orlando, FL I am often pulled in many directions, wearing many different hats, and doing many different things. In this position,I have learned that it is important to surround yourself with people who are better than you. Yesterday, I had the pleasure with having lunch with Rob Daniel, who is a BOLD coach for MAPS coaching. Rob, in true coaching fashion, asked me about my goals; am I on track to hit my goals, and when I do or don’t achieve those goals, what happens to me? We have often heard, or are at least experience that Real Estate is simple and yet it isn’t easy. It is simple, because there is a plan, and there is a formula to carry out that plan. It isn’t easy, because that plan needs to be followed. Those people who have clear goals in 2014, as you read this, ask yourself; do your daily activities match your goals? If we break it down, there is a success formula, and I share with many of the agents whom I coach. Step 1: Know where you are at – what did 2103 look like for you? Are you happy with your results, and if so, have you reached your full potential? Everything that you measure when you make a goal in a business plan, give yourself a report card from your past successes or failures. Step 4: Make adjustments, and this is the most important! A formula that if nothing else I want you take from this is your Actions (x) your conversion Rate (=) your Results. I promise, if you are passionate about your goals, and are aware of your conversion rates, you will succeed! So my epiphany in the last 12 hours after my lunch with Rob is that how I am living each day at the office, doesn’t match my goal. I have some clarity. I need to grow this office, to teach, train, and develop my agents to be better business people, and my daily activities don’t reflect a match. To be successful in 2014, I have a new clarity and purpose. My days start at the gym at 6:00 am, in the office at 7:30. From 8:00 – 9:00 I am coaching, running a meeting, or practicing to improve my skill sets with other Team Leaders in the country. On Monday through Wednesday is when I focus on agents outside of Keller Williams, I book 12 Appointments, and 10 of them show up, and I am building relationships and adding value to agents outside of my office. On Thursdays I train, facilitate meetings, network, have outside appointments, and on Fridays I do one on one coaching for my own agents. I have clarity! I used to start my week, and let the appointments fill in the blanks, and now I have created a life and business by design where the day is designed, and now I simply fill then in with the right names. Do your daily activities match your goals?? Do you know what you need to do TODAY, and when you do, you can measure it as a successful day? Gary Keller and Jay Papasan tells us in the One Thing book, the average person will create a habit in 66 days. This concept is simple, and yet it isn’t easy! Every month The Orlando Regional Realtors Association sends out data regarding the housing market in Orlando, FL. Below are some numbers that come with it, so as you interpret, what stands out to you? Over the next couple of minutes you will get my interpretation of the Orlando Real Estate Market. I am seeing some trends of the market correcting itself rather quickly. In the past 7 months, the APR has increased by 25% now sitting at 4.28%; (although a nice difference compared to the spike of up to 4.64% we saw in the 3rd quarter). On our average price point of $155,000 loan, that would increase the monthly payment by nearly $100 per month. Have you conveyed this to your Buyers to create an urgency to get under contract today? For several months in a row, we have seen in Orlando that overall, we are in Seller’s market, being less than 5 months of inventory. As the Real Estate industry has for years, it is constantly correcting itself, and tipping the scales back into a balanced market. With 9,470 homes on the market and 2,312 closed, we are above 4 months for our saturation period. 2,312 is the second lowest number of homes sold in the past 12 months, and this is the most number of homes we have had in our inventory in the past 12 months. Another interesting number to look at is the average days on the market; within 1 day of being the shortest in the past 12 months at 64. So what is this indicative of? Homes are selling quicker, which likely means that Short Sales are less of our selling inventory and we are seeing traditional homes continue to rise as more and more sellers have equity; we are in a similar price point that we saw in 2003. So what does this information mean for you, for your buyers, and for your sellers? Now that you have read it, what do you do with it? Well to me, I see the market slowing a bit from its dramatic ~25% increase in average price point that it has done year over year. The demand of the market doesn’t demand for the buyers to be in as many multiple offer situations, which slows down the growth. The seller who has waited a year to get more equity in their home, it has paid off. If you still have Sellers waiting, they need to see these numbers that show it slowing down, and it is important they get on the market while we are still below that 5 month saturation rate; keeping them in control in a Sellers’ Market. As for your Buyers… well, they saw how quickly interest rates can rise, and need to see the home prices still rising. Let’s do a quick scenario. Home prices are rising about 2% a month, so using the example above, we will use the market in February 2013. That 3 bedroom 2 bath house in today’s market sells for $155,000 with an interest rate of 4.28%. 7 months ago that same house sold for $133,300 (14% less) with an interest rate of 3.21%. So a family finances the home and their monthly payment went from $577.21 up to $765.24 per month; over a 30 year loan, that is a $67,690 difference over 30 years, for the same house, in a matter of 7 months. If that doesn’t create urgency, I don’t know what will. I don't sell houses. I sell my service and professional to help you buy or sell your home!